Here are several different dresses and skirts to choose from and a variety of ways you can decorate them. Try making fancy patterns on the printed design using dimensional fabric paint - this works well on paper, felt, craft foam, or fabric. If you want to use fabric, you can use the printed template as a base by simply gluing the fabric to the template. If you want to be one of the first to know when new craft projects are posted, take a few moments to sign up for the Family Crafts Newsletter and you can also chat about crafts with others in the Family Crafts Forum. 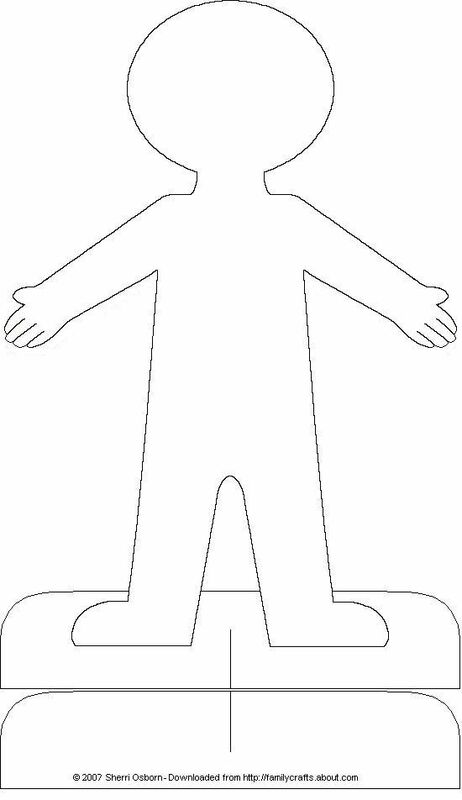 Print out and color or decorate this paper doll. Click on the image above to get to the full-sized version. Depending on your computer, you can click or right-click on the image above and choose to either print it or save it to your computer (you can find saving and printing help here). Printable Paper Doll Dresses and Skirts. Print out and color or decorate this Sun Dress for your paper doll. Print out and color or decorate this long dress with spaghetti straps for your paper doll. Print out and color or decorate this dress with short, puffy sleeves for your paper doll. Print out and color or decorate this long dress with short, puffy sleeves for your paper doll. Print out and color or decorate this v-neck dress with long sleeves for your paper doll. Print out and color or decorate this long, v-neck dress with long sleeves for your paper doll. Print out and color or decorate this v-neck dress with short sleeves for your paper doll. Print out and color or decorate this long, v-neck dress with short sleeves for your paper doll. Print out and color or decorate this long sleeved dress for your paper doll. Print out and color or decorate this long dress with long sleeves for your paper doll. Print out and color or decorate this short sleeved dress for your paper doll. Print out and color or decorate this long dress with short sleeves for your paper doll. Print out and color or decorate this slleeveless dress for your paper doll. Print out and color or decorate this Sleeveless Long Dress for your paper doll. Print out and color or decorate this wrap skirt dress for your paper doll. Print out and color or decorate this pleated skirt for your paper doll. Print out and color or decorate this short, wrap skirt for your paper doll. Print out and color or decorate this long dress with a wrap skirt for your paper doll. Print out and color or decorate this simple skirt for your paper doll.